These words of wisdom float on the brochure cover for the 2010 Nonprofit Conference: Leadership, Imagination and Action. Presented by The Volunteer Center of Sonoma County, California, this March 26th event for nonprofit leaders and managers features keynote speaker Paul Ray, social researcher and author of Cultural Creatives: How 50 Million People Are Changing the World. The above passage was written in 2000. Since then, we’ve seen evidence of the Cultural Creatives phenomenon in grassroots organizations such as MoveOn.org, in Obama’s 2008 campaign and election, in splinter environmental efforts and larger movements. The Internet helps Cultural Creatives communicate about global warming and social justice, but it’s an equal tool for any group of like-minds to spread their messages. President Obama fairly won the election based on the majority of Americans desiring a change in Washington, but since then the factions that didn’t win have claimed “change” as their agenda, and they regularly oppose anything that our President is trying to put in place, be it health-care reform or environmental. “Change” by definition is “away from” or “different than,” but it also needs to be “toward” something—forward thinking, considered, moral, helpful, productive, necessary, imaginative. The individual and collective imagination can lead us to a different kind of thinking. As a society, we can author cultural change the way a writer, artist, or composer creates his or her work. Take all we know, use our best skills and talents, and start with a blank sheet. The “white space” is not “nothing” or “empty.” It’s like white light, containing all the colors, and it’s a fresh start, unencumbered by shadows. The people I know who fit the Cultural Creatives definition (and that’s a lot of people, especially where I live in Northern California!) are not invisible, but are really busy. They are working, volunteering, contributing, expressing themselves, and caring deeply. Social media allows all of us a visibility not available a decade ago. Still, it’s easy to slip into complacency by default, not intent. It’s easy to rail at Fox News and the misinformation taken as gospel, and not do anything constructive to inform others with the truth. And what is the truth? How do we know it when we see it or hear it? And when the truth is irrefutable or can be proved beyond reasonable doubt, why do many people refuse to hear or believe it? I will be making a visual capture (with paper murals and markers) of Ray’s talk and the World Cafe which follows it. 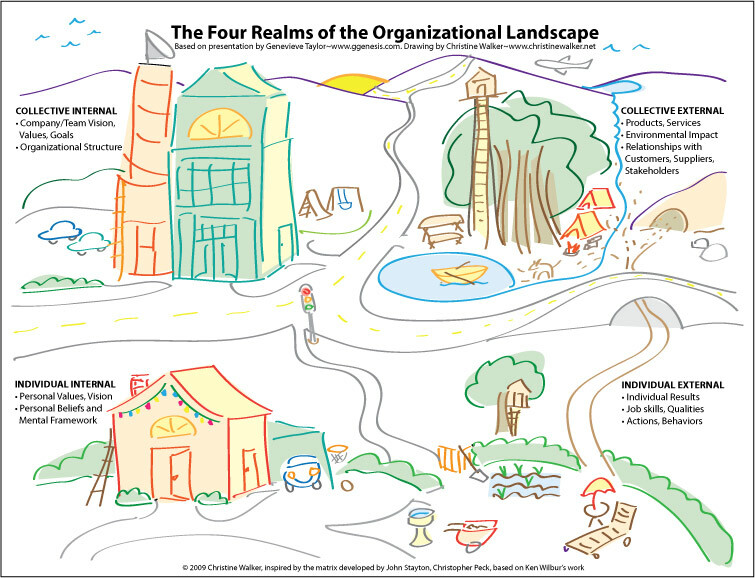 Strategic visualization is a tool that serves cultural creativity well: we are increasingly a visual culture, more adept with visual media and used to responding to and interpreting images and symbols. We can move collectively toward a future of hope and prosperity only if our individual visions are compatible. In making those visions tangible, we find language for discussion and action moving forward. Whenever we gather for positive change, we can narrate and draw the vision. See what we can agree upon. Be sure that we’re all on the same page and looking for intersections of agreement, not only for disagreement. We can discover threads of thought and follow them to surprising, beautiful, and beneficial conclusions. Those conclusions will serve us until new conditions prevail, once again requiring new imaginations to solve problems created by former ways of thinking. Music. Singing. Rap. Ex-prisoners. Heart-rending and heart-warming stories. At a bank? Yes, last night at OneCalifornia Bank, the kick-off party for Insight Out—an innovative idea from the Insight Prison Project—offered an unusual mix. I’ve been a branding and marketing consultant for OneCal Bank since before its launch in 2007, so I attend their events as a member of the OneCal family. Last night, as a group of ex-offenders was welcomed into the fold, I stood with wine glass in hand, tears welling, listening to the four men and one woman tell their stories. They have all experienced violence and been the perpetrators of it, and they’ve all “sat in the fire” of the process brought to them by the Insight Prison Project and Jacques Verduin, IPP’s Executive Director. Their work with IPP in violence prevention and other programs while incarcerated enables them, once released, to give back to and help break the cycle of violence in their communities. The woman told her story of being raped at 11, raising the son she bore, and, when he was killed at 15, wanting to hurt others as much as she was hurting. She said she’d done things she shouldn’t have and was imprisoned for them. Over the years, she’s also lost a brother and nephews to street violence. Through IPP, she experienced her pain—sat in the fire of it instead of lashing out to others. This kind of deep healing extends to us all—across gender, race, class, and culture. One of the men, who while in prison had lost a son to street violence, thanked the 140 or so gathered for being there. He said that most people don’t want to be in the company of ex-offenders. He has turned his rage and regret for all he’s done into a passion for helping young men veer from the path to prison that their fathers took, that his father and grandfather took. Doesn’t it feel good? The load seems lighter when we pick it up together. Kat and Jacques asked that people get involved with Insight Out and give in any way they can. From the event announcement: Insight Out is a bold new initiative that amplifies a select team of ex-offenders to be gainfully employed to work with youth to prevent crime and promote healing. They function as Change Agents in the community, giving back to the places they once took from. All of them have been trained by the Insight Prison Project during their incarceration in San Quentin State Prison. Some are former life sentenced men, some shorter sentenced, many of them worked with youth while inside, all are uniquely talented and motivated human beings. Their expertise is in transforming those negative habit patterns that sabotage a person’s efforts to live a productive and soulful life, no matter the academic achievement or being employed. For Dennis Hysom‘s “Last Great Places” music & nature instrumental CDs, originally commissioned by the Nature Company/Discovery Communications in tandem with The Nature Conservancy, he traveled to Alaska, North and South Dakota, the Louisiana Bayou, Costa Rica and the Caribbean to witness and record endangered species and natural habitats. Those projects inspired our “Earth in Concert,” initially a brand for music projects, now encompassing all of our endeavors, which are linked by artistic exploration and partnerships in music, art, writing, design, and nature. With this Earth in Concert blog, Dennis and I join in collective creative efforts to generate prosperity, peace, health and happiness in the New Year and beyond.